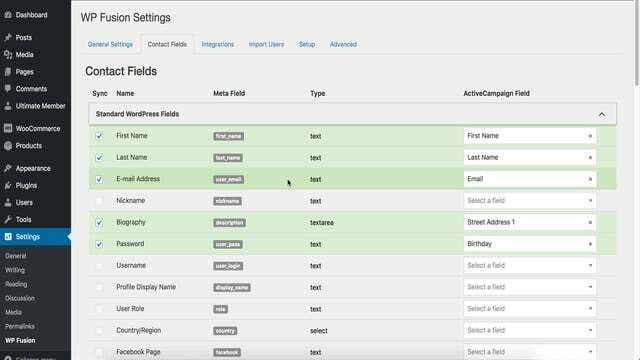 Using WP Fusion, it’s possible to sync a user’s user name and password to their contact record in your CRM. If you have a Professional license, you can set up a WP Fusion install on a different WordPress site and use WP Fusion to pull the latest user name and password from your CRM, effectively keeping your customer logins in sync across two or more WordPress sites. To set up the integration, first navigate to the Contact Fields tab and click the check boxes next to Password and Username. Then go to the General Settings tab and make sure the checkbox next to the Push option is checked. Note: All data is synchronized with SSL encryption but passwords are stored in your CRM application as plain text. Make sure that everyone who has access to your application is trusted before you choose to synchronize passwords. Now, when a user creates an account or updates their information, their username and password will be synced to to your CRM. You’ll then want to configure a webhook to push the information to the other site(s).